Danny Kaye goofing with Lucille Ball, swinging with Louis Armstrong. Does the name Danny Kaye ring a bell? Ring-a-ding-ding, it should during this holiday season. Kaye, who died in 1987, is the guy opposite Bing Crosby in 1954’s classic White Christmas. Not that he wasn’t a star in his own considerable right. Kaye stood out as a singer, dancer, comedian and storyteller, with 1956’s The Court Jester, an all aglow Technicolor production that showcased all of those talents. Then came the small screen and The Danny Kaye Show, initially in black-and-white, later in color and enduring from 1963 to 1967 on CBS. In its first year there were 15 other prime-time variety/comedy shows with the star’s name in the title. Kaye inched into the list of the top 30 most popular programs for his one and only time, tying for the last available spot with Bob Hope and trailing the likes of Ed Sullivan, Red Skelton, Jack Benny, Jackie Gleason and Walt Disney. All of them ran behind The Beverly Hillbilliies. The Danny Kaye Show was his one and only stint as the star of a weekly television series. He threw himself into 121 episodes, with Harvey Korman his most frequent second banana before he went directly to The Carol Burnett Show. 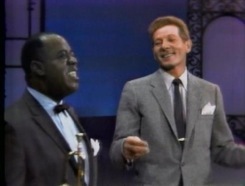 The recently released Danny Kaye -- Legends offers six full episodes on two discs, with the guest list including Lucille Ball, Louis Armstrong, Tony Bennett, George Burns, Shirley Jones, Liberace and Imogene Coca, the old stalwart from Sid Caesar’s Your Show of Shows. For the next several minutes, some of those frantic wardrobe changes are shown as seldom seen before or since, with a collection of stagehands trying their best to undress and dress the two stars. It’s a completely fascinating look at how the veritable sausage is made. Ball and Kaye also combine skills on an ambitious production number that requires them to pop dozens of balloons until just one big one is left. Less successful is a sit-down bit in which they play a husband and wife whose maid has taken over their parenting duties. “I know who’ll fire her. The fire department,” Kaye ripostes. It’s more fun watching him mug his way through Ball’s recitation of the savory dinners the maid also contributes when not monopolizing their new baby. Korman comes to the fore in the show with Bennett and Coca. A very lengthy maritime sketch ends with Kaye, Korman and Coca all cracking each other up in an appetizer for Korman’s subsequent sketch adventures with Burnett in general and Tim Conway in particular. Korman appeared in 82 Kaye shows, according to imbd.com. It proved to be an endurance contest with a moody and demanding host. None of this is evident in the finished product. Other high points of Danny Kaye -- Legend include his free and easy swinging with Armstrong, reminiscing at length with Burns and merely gazing upon Jones, who looks positively luminous in the collection’s first color episode. The worst moments of The Danny Kaye Show are some cloying, closing interludes with a little girl he very much favored -- Victoria Meyerink. This collection features two of these get-togethers, with Victoria sitting on his lap while Kaye coos and sings. She seems somewhat although not entirely uncomfortable, whether singing in turn or telling a joke. Throughout much of his career, Kaye was the foremost ambassador/fundraiser for UNICEF (United Nations International Children’s Emergency Fund). So his fondness for kids is genuine. Still, the segments with Victoria come off as kind of creepy all these years later. Even the studio audience doesn’t seem to respond all that well to them. Kaye is on far firmer ground as a sketch performer and dancer with talent to burn and the time to let it all air out. Broadcast network television hours of the 1960s had about 10 minutes more running time than they do today. So nothing seems to be in a rush, whether the host is delighted to be in the company of Burns or participating in that memorable outfit-swapping extravaganza with Ball. Well, that was done in a rush. But the sketch itself keeps going and going. Kaye closed each show by dancing and skipping off into a bright blue yonder after cracking a climactic joke. “If you’re one of those who can’t brush after every meal, have toothpaste for lunch,” he says after thanking guests Ball and Gary. 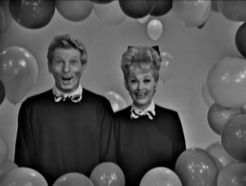 If you’re a student of television’s distant yesteryears, Danny Kaye -- Legends is worth your time and money. It showcases a truly unique individualist in times when variety shows were the norm not the exception. Kaye took full advantage, showing off his many talents, showcasing his guests and grooming Korman for all those best days ahead of him.